Niels sent me pictures and a description of his modification for an AOR1000. The AOR AR1000 contains two FM receiver ICs: one for narrowband and one for wideband FM. When you remove the back of the scanner, you can see both ICs. 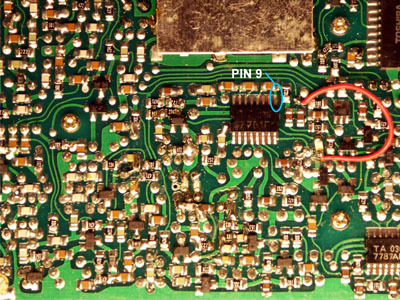 The WFM IC is located in the lower right corner of the PCB, the NFM IC is located near the middle. The NFM IC will be equipped with a discriminator output. It is a TA7761, with the unfiltered audio at pin 9. A 10 k resistor is soldered to pin 9. The resistor's other lead is connected to a 3.5 chassis terminal. 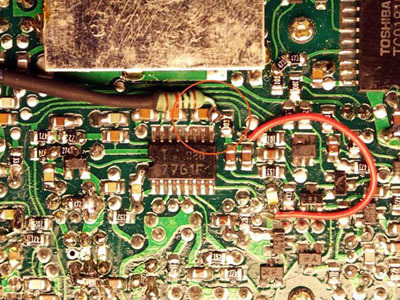 The chassis terminal's ground is connected to a grounded solder pad on the corner of the PCB. A 2.2 nF capacitor is soldered across the contacts of the chassis plug. The scanner's case already contains a hole (possibly for an extension?). I used it to mount the chassis terminal. Some milling was necessary to make it fit.